Welcome to the fifth step in our free professional learning series on building your PLN. Explain what a blog is. Unpack the benefits of using blogs as part of your PLN. Describe some of the ways people keep up to date with blogs. Explore how to use blogs as part of your PLN. Blogs play an important role in most educators’ PLNs and making blogs part of your PLN is more than just publishing posts on your own blog. If you don’t see yourself setting up your own blog, there are many benefits to simply reading, commenting, and sharing other people’s blogs. Blogs have been mainstream for well over a decade, so you might be very familiar with what a blog is (you’re reading a blog right now!). However, let’s take a moment to define what exactly a blog is as the term continues to evolve. Over recent year, the lines between blogs, websites, ePortfolios, and other online spaces have been blurring. A blog is simply a website, although traditionally a website will have been more of a static space. What makes a blog different than a simple website? A blog traditionally would be updated fairly regularly and display posts in reverse chronological order. Comments have always been a key feature of blogs, providing an interactive space. Most blogs have pages where some key information is housed that isn’t updated very frequently (for example, an About Me page). Nowadays, some people have a website that has a blog component; the home page doesn’t change but readers can click on a tab to view a regularly updated blog. An example of this is Langwitches’ “Online Hub”. This is a website that displays Silvia Tolisano’s professional portfolio and there is a blog section that readers can navigate to from the front page. This video also provides a simple overview of what a blog is. Refer to The State of Educational blogging in 2017/2018 for more information on why educators use blogs. Your personal blog extends your relationships outside of your school and allows you to connect with global educators who all willingly help each other. 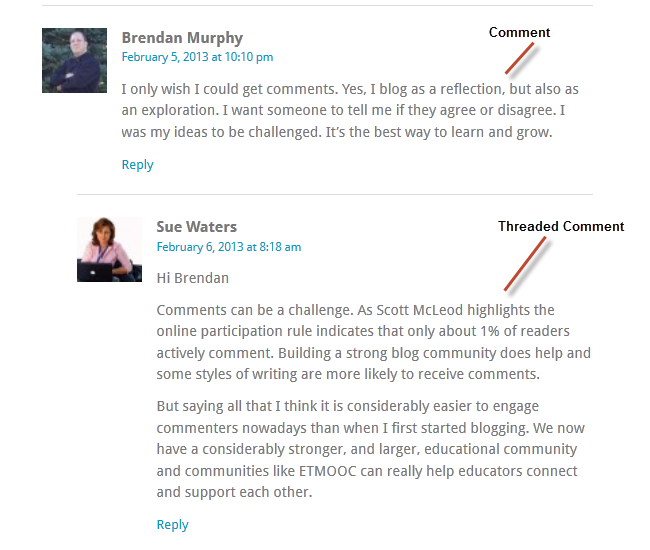 Sue Waters, who is the backbone of Edublogs has reflected on her own experiences of blogging. It took almost a year from being shown what a blog was to becoming a blogger. The online tools I used before blogging were excellent for sharing information. But blogging gave me what they lacked; the ability to reflect, collaborate, exchange ideas, and connect with other people. Ultimately, blogging completely changed my life; it’s the reason why I’m now employed to do the work I do and blogging helped me build a strong PLN. It’s also important to remember that not everyone who makes blogs part of their PLN are bloggers themselves. It’s really up to you! Some educators prefer to read and comment on other people’s posts while other educators also have their own personal blog. If you have a vague thought in the back of your mind about starting your own blog but you’re not sure if it’s for you, hopefully Sue’s words above remind you that you can jump into blogging with some reluctance and you may be pleasantly surprised. Read and comment on other people’s blog posts. Then share anything that resonates with you with your PLN (e.g. on Twitter). Publish posts on your own blog to reflect your thoughts, ideas, and/or to share resources. Remember, this is optional but keep it in mind! Like everything, there are tips that’ll both save you time and make you more effective. There are thousands of educators out there who are regularly publishing on their own blogs. Many of these blogs revolve around specific topics, interests, or subjects areas. Others are more general reflections on all areas of education. Reading blog posts is an important part of connecting with other educators. But how do you keep up to date with your favorite blogs and know if something new has been published? Interestingly, when we did a quick poll of our Edublogs community in July 2018, 61% of respondents indicated that their favorite way to keep up to date with the blogs they like to read is via social media. This might demonstrate that people are okay with consuming information serendipitously (there’s no guarantees they’ll see posts on social media). To avoid being swamped by emails, perhaps people choose to subscribe to only their very favorite blogs in this way. Feel free to tell us what you think in the comments! Many bloggers have an option to be notified via email when they publish something new. This might be via a simple email subscription widget on the sidebar of their blog. In this case, you’ll receive an email automatically to alert you to new posts. It’s also becoming more common to see educators (and bloggers in general) create their own personal email newsletter to keep readers up to date. This might be sent out every time they publish something new, or there might be a weekly or monthly summary email. Check out the sidebar of your favorite blog and look for a sign-up box. One of the easiest ways to keep updated with posts from your favorite blogs is to subscribe to their RSS feed using Feedly. The free version of Feedly allows you to follow up to 100 sources which should be enough to keep you busy! Refer to these step-by-step instructions on how to set up Feedly. There are other similar tools, but Feedly is one of the most popular. Here are just a few popular education blogs you can subscribe to using Feedly. If you follow your favorite bloggers on Twitter, no doubt you will see them announcing when they have something new on their blog. Of course, there are no guarantees that you will always see this. Another option Sue Waters uses on her mobile devices is subscribing to her Twitter timeline and Twitter hashtags using Flipboard. This pulls all the links shared on Twitter into her Flipboard account in a magazine format where it’s easy to read, share, and comment on articles shared by her network. You’ll find detailed step by step instructions on how to set up Flipboard here. Watch this video to see how Sue uses Flipboard. Your commenting skills and how you engage in comments with others on blogs posts is one of the most important, and often overlooked, aspects of using blogs as part of your PLN. The comment section is where the deep learning, questioning, and reflection can occur. Comments turn your blog from a static space into an interactive conversation. 1. Don’t just lurk — comment! Of course you’re probably not going to comment on every blog post you read, but every now and then make the concerted effort to scroll down to that comment box and type a response, ask a question, or share your own insights. Your comments don’t have to be long to make an impact. Remember, being part of a PLN is about giving as well as receiving. Taking the time to begin conversations will pay off! If you’re a blogger and someone leaves a comment on your post, make sure you approve the comment quickly (if you moderate comments). There’s nothing more annoying to a reader to see that their comments haven’t been published. They might forget about it and not check back to see your response. If readers have made time to comment on your posts the very minimum you should do is respond back to your readers (ideally each reader) in the comments on your post. This is very important for building your blog’s community; it demonstrates that you value your readers and their input. If a blogger provides a subscribe to comment option, then make sure you select this option when leaving a comment, so you’re notified by email of any follow up comments. If you’ve never blogged before, hopefully you’re reading this with the open mind to consider starting a blog now or even in the future. But there are so many blogs out there! Why should I start one? This is a common concern for people contemplating whether to start their own blog. They might feel like there is so much noise and so many blogs that are already established. They wonder what they could possibly have to add to the community? We can assure you, you do have something worthwhile to share! You are the only you. Your unique perspectives could be exactly what someone else needs to hear. My best advice…write for you and don’t overthink. See every blog post as a rough draft to something you are building over time, not a college term paper. The more you do it, the better you will become. The better you become, the easier it will be. Be kind, be thoughtful, but don’t overthink. It is probably holding you back for inspiring someone else, and probably surprising yourself. Check out Obvious To You, Amazing To Others by Derek Sivers. There are many advantages to blogging. 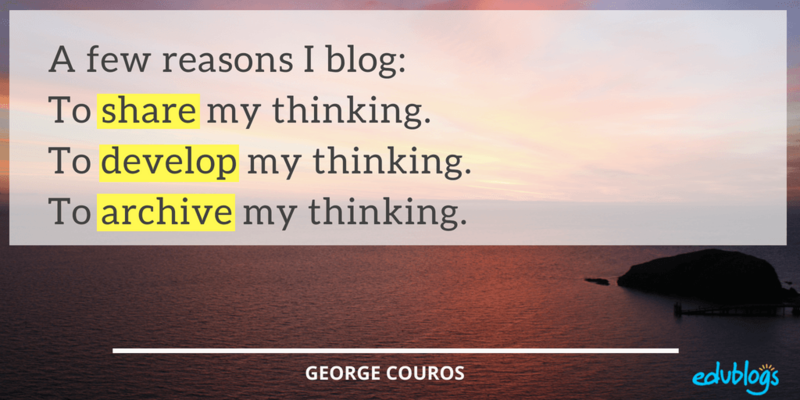 George Couros’ three reasons for blogging are shared by thousands of educators worldwide. One of the great advantages of having your own blog when you’re setting up your PLN, is that it’s your online home. Maybe you’ll discover a really cool tool, article, or resource. You could write about it (and share your learning with others). Perhaps you’ll connect with some like minded teachers and possibly start some sort of collaboration. This would be perfect to blog about. Even if your blog doesn’t really have an audience, a blog can be a fantastic place to keep track of all the work you’re doing both online and offline. Your blog can also become an excellent professional portfolio. This can be an advantage when you’re trying to demonstrate who you are and what you’re passionate about for future career opportunities. An effective personal learning network and a willingness to share has enabled me to enjoy some incredible learning opportunities both inside and outside the classroom in the last few years. When I look back, even getting that first job offer in a market saturated with teaching graduates was directly attributable to an online professional presence. What Platform Should I Blog On? If you’re still reading, hopefully you’re thinking that setting up a blog is a possibility. So you might be wondering where to set up your blog? Edublogs and CampusPress are powered by a customized version of WordPress. WordPress is the tool of choice for the large majority of professional bloggers and online publishers. In fact, over one-third of the entire web is powered by WordPress. It’s highly customizable, export-friendly, and it works! It’s free to sign up for a blog at Edublogs and it’s the world’s most popular platform for educational blogging. Just go to https://edublogs.org/ to sign up! Read more about the advantages of using a WordPress based platform like Edublogs in this post. Ready to start your blog? We can help with that. Our Personal Blogging Series takes you step-by-step through the process of setting up your own personal educator blog. It includes links to other educators’ blogs so you can see how they use their blogs. Already dabbling with blogging? You’ll find our tips for writing more effective blog posts here. Conclusion: Why Blog When You Can Microblog? There’s a lot you can learn from getting involved in the blogging community whether that’s writing your own posts, or simply reading and commenting on other blogs. However, this takes a certain amount of time. So what is the benefit of using blogs as a part of your PLN, as opposed to a tool like Twitter or other forms of social media? Simply put, the more you put in the more you get out. Blogging allows you to dig deeper and really form strong connections with others. You’re not limited to 280 characters like on Twitter. You can write thousands of words if you like! Or at other times a few short sentences might suffice. The choice is powerful. Tom Barrett created the following diagram for a post where he explored the impact of microblogging. There is nothing wrong with the amber lit retweeting and sharing, but for many people we are sharing in an attempt to have the most impact on others. The micro engagement that occurs as people share without reading and, reposting content without engaging any further, is much more prevalent than the more in depth discussions of 10 years ago. There’s definitely room for the amber, but think about the benefits that the green could bring to your professional life too. Like all other aspects of building a PLN — what you get back is directly related to what you put in! Hence, blogs are one of the most significant online tools that can help you build your professional and personal learning networks. There’s no limit to the people we can connect with, be inspired by and stretch our professional wings with and blogging offers a great opportunity to do that. I feel that, blogs will be a must for anyone who wants to develop a PLN for himself, since it is the most open, creative and free way of sharing knowledge and expressing oneself. So embrace blogging in your daily lives and grow your learning networks personally as well as professionally. Share a link to an educator’s blog that you enjoy reading. Tell us what the blog is about what you get out of following the blog. Also, mention how you stay updated with the blog. Do you just check from time to time? Do you have an email subscription? Or do you use a tool like Feedly or Flipboard? Set up Feedly and/or Flipboard, referring to the instructions in this post. Leave a comment to tell us how you went setting up the tool. Let us know who you subscribed to and why. 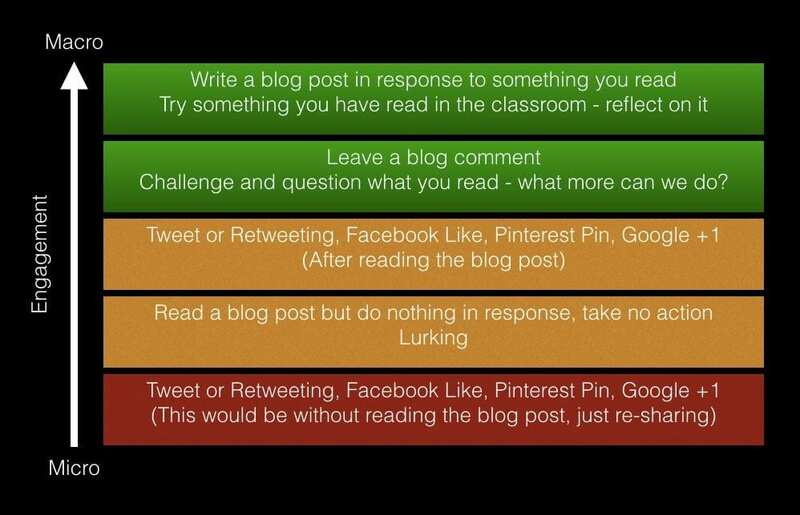 How do you use blogs as part of your PLN? What did you learn about using blogs for building a PLN that you didn’t know? What do you like/not like about Feedly, Flipboard, email subscriptions, or blogs? I chose to set up a Feedly account because it was an easy way to connect and stay updated with a wide variety of education blogs! Other than occasionally reading blog posts that I come across while researching or brainstorming for lessons, I haven’t subscribed to or connected with any blogs. Using the Feedly app will allow me to explore blogs that may be of interest to me. I’m excited to find and follow blogs that I can use for my professional development. I used Feedly and I looked up 4th grade because its the grade that I teach. I was able to see that there were many useful resources about teaching that will help me improve in my teaching. I fell encouraged to continue using these tool that will help me to continue to learn about my profession. I set up a Feedly account because it was free and then I searched for the grades I want to teach, starting with Kindergarten and found a bunch of blogs that I actually already have subscriptions to such as Kindergarten Smorgasboard. I stay updated with their blog through email. I can’t wait to dive in and use this tool to follow even more! Setting up feedly was easy because I was able to connect my google account to it. I decided to create a Feedly account which was free to do and very easy. First, I connected it with my google account and then I searched “kindergarten” which pulled up many different feeds to follow. I started following a few different feeds that will help enhance my knowledge of best practices to teach Kindergartens since I plan on teaching this grade. A blog that I found while looking for primary teacher sites was A Year of Reading (http://readingyear.blogspot.com). This link reviews children’s books, which I thought was helpful for pulling texts for your classroom or lessons. I subscribed to Feedly because it is popular and has a huge number of blogs of various topics to keep my interest- also you can follow 100 blogs for free which is a huge plus! It was very easy to set up my account. I simply linked it to one of my google accounts, and then searched the term “education.” I subscribed to “Free Technology for Teachers” because I am currently taking a technology course for educators, so I think this information could benefit me for this course and more. I really enjoy reading the 4th Grade Frolics blog. I am currently a pre-service teacher and my dream is to teach 4th grade so I absolutely love all of the ideas and lessons she has for a 4th grade classroom! Thanks for sharing the link to that blog. It’s certainly very eye-catching! The slider at the top is a handy way to navigate posts too. An educators blog that I enjoy reading is Teacher Reboot Camp. The link is: http://teacherrebootcamp.com/2019/01/16/digitalwellness/. I enjoy this blog because it has different tools and strategies for teachers. Additionally, the layout is clean and easy to read. I stay updated on this blog and other blogs by checking occasionally. Shelly sure has some great ideas to share! I find she often uses lists, bullet points, and visuals which make her posts easy to read too. I enjoy reading Catlin Tucker’s blog, CatlinTucker.com, because it contains clear pragmatic posts, such as “Internet Archive: Go Back in Time with the Wayback Machine” (Jan. 7, 2019). I also enjoy Lisa Nielson’s blog‚ The Innovative Educator, which has clear informational posts, such as “Google+, Facebook, Twitter, and Blogs – When and Why to Use Each” (July 17, 2011). I used to just check their blogs from time to time. I now follow both Catlin (@Catlin_Tucker) and Lisa (@InnovativeEdu) on Twitter . I enjoy reading kidney-garden.blogspot.com. It gives me great ideas for lessons. I haven’t subscribed to it. I just look it up from time to time. I actually wrote this blog for one of my classes, but it really fits the theme here! I have met so many other educators and learned from them by following their blogs and reading what they share on twitter. This has helped me grow my PLN by leaps and bounds. Thanks for sharing this here, Angie. I bet other participants will be able to get some new ideas for blogs to visit from your Padlet! I follow https://www.notsowimpyteacher.com/ which is a teaching blog by Jamie, the Not So Wimpy Teacher herself! I check the blog from time to time on my own, but she also sends a weekly email with tips, tricks and freebies that are linked to her blog and TPT store. Clipboard became an essential part of my daily routine. I check it every morning while commuting to work to be updated with the changes and new trends in education, business and technology because these are my favorite fields. Also, I intend to blog basically to communicate with my peers and PLN. That sounds like a great routine. I hadn’t heard of Clipboard! I currently use Flipboard to curate educational content in order to stay in touch with current development in education. Yesterday I set up a magazine to curate content from #edublogs and other relevant educational sources and I intend to build the sources everyday. This was a really interesting post and has encouraged and inspired my own thoughts about blogging. I particularly found the words of Sue Waters and George Couros helpful – effectively just do it and you will get results. So I’ve written another post on my own blog – basically following my thought pattern as I read this one – practice makes perfect, as they say! I have a feedburner account so I was wondering if it serves the same purpose as feedly. I agree with this post. Blogging is a way of sharing and connecting to those who have the same ideas as you to certain issues. Nik is one of the educators who are relatable. He explains how to use a certain tool along with a lesson plan, so I can visualize it and try it out with my students. Feedly and Flipboard are very nice tools to stay up to date. I had no problems setting them up. What I like is, that it is up to you, how much time you spend on the blogs. I still find it difficult to post blogs – at this time I prefer setting up web pages, as in my neuropathology blog: https://neuropathology.edublogs.org/ . But maybe if people leave a message, a network might form. Besides other blogs, I follow your „edublogger“ blog which I really enjoy reading. It is very inspiring. I posted a question concerning plugins and got a quick answer. I keep an learning map at scribd https://www.scribd.com/lists/4503665/Certificates to have in mind what I have studied and wich is next logical step and also to make new conectios based on same interests. Sometimes I write a blog article with a response to something I do not want to repeat. If question came in discution I fwd article. I set-up both Feedly and Flipboard. I consider myself technically literate, but I had trouble setting these up, even with the videos. However, I have some sources loaded in them now and I have checked out a few articles. So, I think a couple of more days working with these I’ll get the hang of them. I have a question. I also got gutsy and edited the “blogroll” section of my blog, to help me develop my PLN. They are two Google sources with the links category of “web accessibility.” In each case I checked off “target = blank, new window or tab.” However, when I click on those links they stay on the same window. I’m working in Chrome. I used the same settings for the Edublogs links and same thing, they also do not open in a new window. Anyone have any ideas about how to fix that? This is a good question. Because you’ve used an accessibility-ready theme, this stops links from opening in new tabs. You also have the accessibility plugin activated which you don’t need as you already have the accessibility-ready theme. When you have time, you might want to go to Plugins in your dashboard and deactivate the accessibility plugin. Nice work getting Feedly and Flipboard set up! I found I had to dabble with both of them until I really got the hang of it. Hang in there! Thank you for the explanation Kathleen! And I took your advice to deactivate the accessibility plugin. Once upon a time I had set up Feedly. I clearly didn’t keep up with it, and I think it may have been linked to my old district email. So, I started over! I forgot what a handy Feedly can be. I tend to be a little random about checking blogs. It’s usually when I come across something on Facebook or Twitter that I’m reminded to check in and see what new posts have been written, or I’m teaching something specific or looking for new ideas. I like https://www.tarheelstateteacher.com/blog/ She has great resources for upper elementary school teachers. I read her post on morning meeting last summer and was encouraged to revamp the early months of how it works in my classroom. I’ve also learned great techniques for teaching math. Another is http://ajjuliani.com/blog-2/ This one has more big picture ideas and teaching to the whole student. Both of these I just randomly check in with when I have time, but I have now added them to my new Feedly account! I was the same with Feedly. I dabbled for a while but when I set it up properly I found it really useful! I tend to use a mix of checking some of my favourite blogs on Feedly and finding others serendipitously, as you said. I really enjoy reading AJ Juliani’s blog but I hadn’t heard of Tarheelstate Teacher so thanks for sharing. Her morning meeting ideas look great! Before now, I have heard and learnt about blogs and blogging but here at Edublogs, I am learning tips that could help with starting a blog, taking a step at a time and blogging one’s way to online visibility and significance. What I am not sure of though, is if Feedly serves the same purpose as Feedblitz and Feedburner. I just set up Feedly. It was a bit challenging, at first, because everything I was looking for was not coming up in the results. Then I clicked on Education and a few of my favorite sites popped up. I followed Principal of Change- George Couros site. I have read Innovators Mindsets three times and it was in an online book study with George Couros where I was challenged to start my blog. I also followed Ditch that Textbook. Matt Miller is an educational inspiration to me and I read his book also. I also follow TED talk. I always like to know the latest in TED talks. I set up Feedly using my Google account and it was super easy. I already found a teacher that I buy products from on TPT. When I clicked on her post she had blogged about videos for teaching about the Arctic. Reading this blog post has saved my quite a bit of time. I can definitely see the benefit to reading blogs, but am still unsure about writing my own. I think I will read and comment for a while before jumping in to my own. That’s great to hear! And ‘lurking’ for a while can sometimes work well. I know creating your own online space can be a big leap! After viewing the videos on you tube about Feedly I was anxious to go to the site and sign up. What I needed to do to do that was enter an email address and create a password .After that I was allowed into the site .I went straight to the search bar and entered a topic of my choice which was ESL google news and followed them. Great! I hope you find Feedly useful. It’s a tool I use a lot now I’ve set it up properly with some of my favourite blogs and sites. It works, Kayley. Well done! Are you on Twitter? This is also a popular place for teachers to share their work (as you may know!). I had problems to post today so I am writing again. If you ask me about the importance of blogging in my life I would add that it has helped me think and reflect. I have also become a follower of many blogs online, I regularly receive mails and check the content. I learn about new tools, projects and I share my experience online and what I would like to do with the new tools. Blogging helps rethinking and we can connect with the others. Social networks have done a lot and I check them too. Nice work, Tiziana. I look forward to reading this new post! Thanks. I have learnt so much about the best ways to be online and connected. I think blogging is a great way to share information and it really seems like a great tool to use. I think it can be a more personal way of saying what you want but at the same time you can add more of your own touch to it and I think it’s a really great tool. Great to hear you can see the potential of blogging, Mattie! I think blogging is a great way to reflect and share my thoughts as a teacher, I am gradually building my PLN and will be subscribing to other blogs. I set up both the Feedly and the Flipboard. I love the way Flipboard is so easy on the eyes, and the way the pages turn, and I like the way feedly organizes my interests and it is easy to use. The voice thread is a nice change from reading everything, and it promotes the connection feeling! I signed up for feedly and created my blog. I am still Ada Ortega, just that for my blog I am edufd4thght. I also signed up for feedly. Creating the blog was easier than I thought it was going to be. I hope I can keep up with it. Here is the link to my blog. It is very basic at this point but I hope I can work on it soon. I think the blog voicethread is a more personal and non threatening way to share ideas and information in a more real time medium. It also showed me that I can use twitter and blogs together and I never thought I could. Before this, I really did not know much about blogging and only have a slight idea about twitter. From the “Advice to First Time Bloggers” Voicethread, I learned that you should blog about what you’re passionate about. You should dive in and begin, and not worry about whether or not people are reading your blogs. Finally, you should just enjoy yourself! kmellie.edublog.org is the blog that I have set up. I have learned a great deal about blogging because before today, I wasn’t enthused about blogging. The fact that you have to visit and maybe blog daily has me concerned as I’m not sure I have the time for that. I do love the Flipboard thought. The voice thread taught me that I can use twitter and blogs together. I would never have thought to link blogs through twitter, but it seems like a great way to do more sharing. I signed up for Feedly and am excited to read the things I have already added. Well, I did it! I created a freedly account and my own blog. I would like to use the blog to recommend books to read. The more students talk about books, the more they read! @Mary Beth and Candace Interesting to read both of you have set up Flipboard accounts. Flipboard is an essential part of my work flow. @Daniel Common reflection I hear from others is “I don’t have anything important enough to share with the world.” I’ve always taken the approach that if I don’t know it then others probably don’t know it as well. That is often the case and they appreciate the informaton shared. I would also add I often learn the most from new teachers, especially those new to blogging because they share reflections I hadn’t thought of. I just set up a Flipboard account on my mobile device and saved many useful articles relating to technology in education. It is important to stay current and technology engages this current generation of students. I sometimes think out loud, “I don’t have anything important enough to share with the world.” As a young teacher, I am still a sponge, soaking up information from others and making variations to fit my students abilities. I have found blogs to be a good resource for non-commercial resources. An online search for something doesn’t always lead you to the best source. Sometimes blogs are the best ways to find out about the hidden treasures within travel range. We set up a flipboard as part of our faculty meeting on PLN’s. It was simple to set up using these instructions. Hi all, my blog is msrodrigues.global2.vic.edu.au I use feedly to follow a variety of blogs. I find it useful as I can read it when I choose. I do subscribe to some blogs as well, but lately I just add the blogs to feedly. I’ve started to use Flipboard as well. I clip tweets, blog posts (via feedly) and other articles of interest in my Flipboard magazine on Student Voice. At one point I had quite a few blog readers and sites to collect information and that became too much to manage. So I’m bringing it all into one place. To share the posts from Feedly to your Flipboard magazine are you opening the posts up in your web browser to add them? Or are you adding them directly from Feedly to Flipboard? Hi Sue, I use the Feedly app on my phone. I click the share button for Android and it gives me a variety of apps on my phone to choose from. I have the Flipboard app so I add the articles directly into it. I’m glad I asked! I use both every day on my Android devices and I swear that option wasn’t there previously. Both my devices updated today and I can now see the link you mean. Thanks for pointing out that option. That saves me so much time as I prefer to add all my links to my Flipboard Magazines and then share from the Flipboard editor on my computer. – Politness … for how long should we “reply” back to those who reaplied our comments? … shoudl we reply to say “thanks for your comment” in case they have just made observations or should we just reply to those asking questions or starting an interesting conversation? – a “I like” button wouldn’t be wrong so that we know someonelse have already read our post/reply without the need of replyiing or ??? …. Am I thinking wrong here? … how about tweeter … shoudl we reply “thanks” to those who tweet us back or??? I’ve just shared a very interesting blog link and at the end of the blog, right where you reply I could “Share” the informaiton by facebook, tweet, google+ and others ….. How do I that with edublogs? This blog link I’m talking about was on wordpress so I could not comment because I don’t have a wordpress account but I could share it with my colleagues and others. The Share options can be added to any Edublogs Pro blog using either Sharing by Jetpack ( http://help.edublogs.org/sharing/ ) or AddThis Social Share ( http://help.edublogs.org/addthis-social-bookmarking-plugin/ ). The Share options at the bottom of the WordPress post are the Sharing Module by Jetpack. You should have still been able to comment on the WordPress.com post however it is a bit confusing how to add a comment as they do have a lot of options. If you add a link to the post in this comment I can check if they did have an option to add as a logged out user using name and email address. Great question about commenting etiquette! We try to reply to most comments individually but we do this for a few reasons. 1) we’ve reversed the normal order of comments due to the number of comments on these posts. If we don’t reply individually it is hard for commenters to see which comments apply to their comments. 2) Responding back to a commenter shows that you value the time they’ve taken to leave a comment. Downside is if you have a large number of comments on a post, and people have selected Notify me of follow up comments by email, they get a lot of emails when you reply. On my other blogs I’m more likely to use a combination of replying to individual comments with replies to several comments in the same comment. When you use this approach you often use the @ symbol then the comment to the person. @Lisa Thanks for sharing a link to your blog. I’m looking forward to checking it out. Ideally you want to make your comment more than thanking for a comment. Where possible I try to reflect on what the comment might have said or share extra tips that help. Sometimes that isn’t possible so I might just say a collective thanks to everyone for the comment or use some other way of acknowledging the comment. e.g on the Twitter post where some have just left their Twitter username I’ve only responded to those that asked a question or shared reflections. While collectively I’ve said I’m now following you. Thank you Sue and sorry for the delay but I was on holiday last week. Thanks for the great ideas about sharing with other social media networks since I am about to start blogging with my class and that would be useful. I’ve used Feedly for quite a while to manage the blogs I like to follow and this challenge gave me a good reason to blog about the basics of it. The link to the article is above! Thanks for the challenges!